Posted on October 31, 2016 at 12:53 am. Priority payouts to enable faster access to your winnings. An anniversary bonus every time you mark another year of loyalty to the casino. Your own personal Squad Manager, who is there to provide you with personalised VIP service on any and all aspects of your Guts experience. 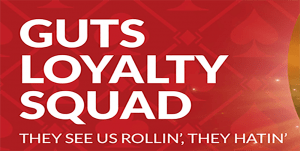 A Loyalty Squad welcome bonus, which is a special one-off bonus to welcome you into the club. Squad-Only offers that are tailored to VIP players to allow for higher or no betting limits plus lower wagering requirements. A birthday gift bonus to celebrate your special day. Invites to exclusive VIP events, from top class sporting events and concerts, to luxury holidays and city breaks. Personalised Squad gifts to reward your loyalty. Loyalty – The more you visit Guts, the more you’ll demonstrate your loyalty, with your love for the venue rewarded. Value – You can prove your value to the Squad with regular visits to Guts, frequent real money deposits and long play sessions. Frequency – Every time you visit Guts you show up on the team’s daily, weekly and monthly reports, so the more you visit, the higher your chances are of showing up on their radar and receiving an invitation. Play on all games and all devices counts and every moment spent on the site will help you stand out from the crowd. Alternatively, you can try to beg your way in to the Guts Loyalty Squad. If you haven’t received an invitation from Guts but you believe you deserve VIP status, or you’ve already earned VIP membership at another casino and would like to make the move to Guts, send an email to [email protected] and the team will take a look at your case and see if you’re the right fit. If you successfully gain entry to the Guts Loyalty Squad, keep in mind that you’ll need to continue to earn your place. Membership comes with certain requirements, and if you don’t play for three months or respond to any of Guts’ communications you could be kicked off the Squad. Make sure you keep your email and phone number up to date so you stay in the loop of all communications. Guts may not offer the biggest selection of keno going around, but it does offer one of the best – Microgaming’s classic keno game. There’s also hundreds of other premium casino games from some of the best software providers, like NetEnt, Microgaming, BetSoft, Quickspin, Evolution Gaming and more, so there’s no shortage of variety to kick-start your loyalty requirements and start earning your place into the Loyalty Squad. New to Guts Casino? Sign up now to receive a new player welcome bonus of up to $400 plus 100 free spins to use on Starburst and start playing your way towards VIP status for some fabulous player benefits.